February 12th was one of those incredibly rewarding days! I wish that I could actually share the experience and my joy with all of you. In August 2008, the Sauti Moja volunteers introduced me to Elema, a widow with three children, none of which could go to school due to lack of money. I agreed with the staff that hers was one of the most desperate situations that we had yet encountered. Elema and her children squatted on a relative’s land; their ‘house’ was riddled with holes; and the only means of support was occasional handouts, including relief food. The family was in a state of despair, and we determined to do something in spite of being convinced that our response was inadequate – perhaps just appeasing my conscience a bit. Elema outside her home with her 3 children back in 2008. As rainy season was approaching, Philip bought plastic sheets to put over her house to keep the rain off and allow them to sleep at night. 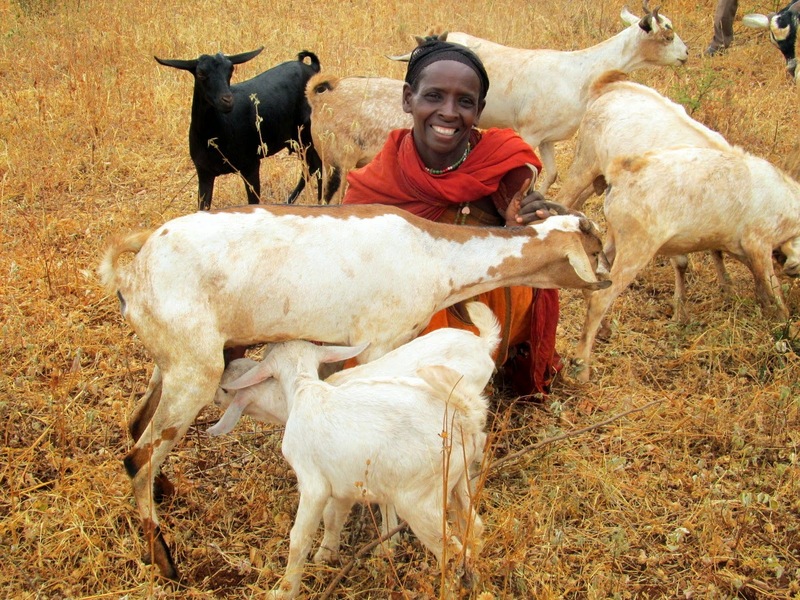 We enrolled Elema in the livestock program, providing her with a donkey and four nanny goats. We used the photo of her and the children in an appeal for food aid during a drought. Thankfully, many from the Sauti Moja community responded, so she and other hungry families received some support. Over the past six years, I lost personal contact with Elema and many of the original recipients of animals. I wondered about Elema whenever I saw her photo on my computer or discussed progress in her village, Qachacha. Frankly, I was afraid to ask about her, specifically, feeling too embarrassed about not having done enough. Thursday, we took a visitor to meet the women from Qachacha, and to hear about the results from our livestock and animal health support over the past years. I recognized so many faces. It was good to hear how donkeys had greatly reduced their workload; how goats provided milk and males were sold to pay for school fees, food, clothing, medicine etc; and how they were paying off their livestock loans by giving female offspring to other widows with young children. As usual, these stories felt good, and made us proud of these mothers and the good work of Sauti Moja Marsabit staff. After the meeting, I hesitantly asked Philip, “Do you remember Elema? Whatever happened to her?” He laughed, “She was in the meeting. Didn’t you see her?”, and then, he called her. How could I ever have recognized this well-dressed, happy woman who was overflowing with gratitude? She told us that her goat herd has multiplied well, and she has paid off her loan. 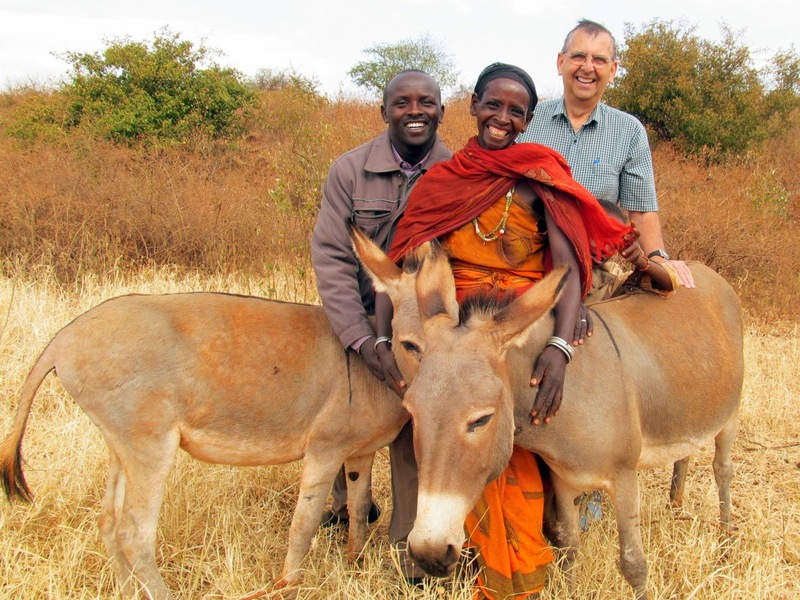 Her donkey has relieved her burden of fetching water for herself and other women in the community. Her children have nutritious food, and she can afford to send them to school. Her housing has improved….. I ‘never’ choke up, but it was all that I could do to hold back tears of joy with seeing Elema after so many years of fearing the worst for her and her children. Elema with Tim and Philip on that special day. "I ‘never’ choke up, but it was all that I could do to hold back tears of joy..."
I was not satisfied, so Lyn and I arranged to go with Philip to visit her home and learn more. We found that she had moved to another village on the land where they had lived when her husband died. She told us that a man had chased them off the land, as she was a widow with no livestock and the land was good for grazing; this is why we had found them squatting on relative’s land. However, when she received livestock from us, she was now chased from the relative’s farm, but fortunately, her home village intervened and made sure that she could return to the land that was rightfully hers. And, it is great land for raising goats and donkeys. Philip, Tim and Elema in her grazing area with her donkeys. We walked to the grazing area with Elema, and her two girls rounded up the livestock. We found a pregnant jenny (female donkey) and another male donkey. (One female colt had been killed by a hyena.) Elema told us how the donkey reduces her workload so much. 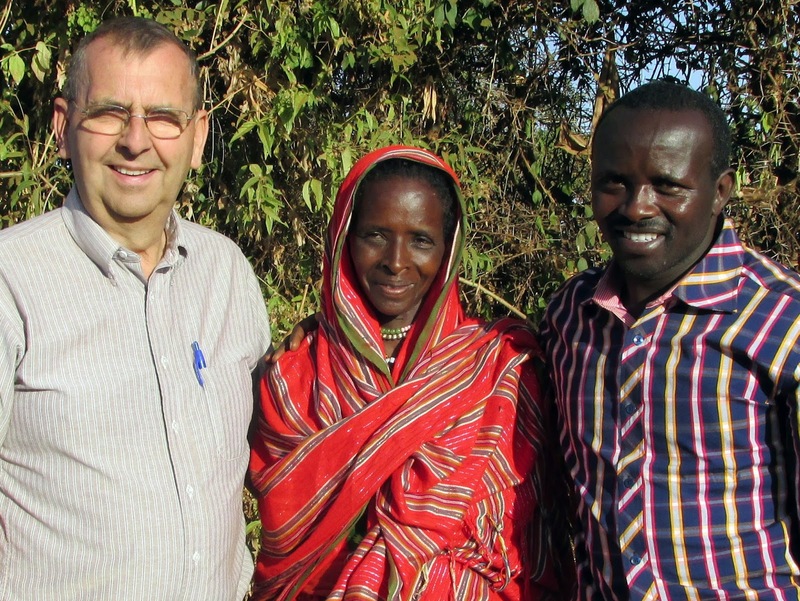 Her round trip to get water varies from 6 to 10 hours depending on the season and supply of water in the wells, but her back is saved! She talked about a past drought when she and her friends used to lift her weakened donkey up in the mornings so that it could get out to graze and drink water. Like other women she is a great steward of what she has been given. was a big psychological boost. What has this meant to Elema? She said that receiving livestock was a big psychological boost, and at that point, her problems were left behind. This was a new start for her and the children. Before, no one had liked her, as she was a burden; she was not even strong enough to get casual labour weeding fields. Now, she has milk to sustain her and her children, she is a respected community member, and she has been able to send her son to school. In her words, “God has blessed us”. Her joy indicated that she truly meant it!